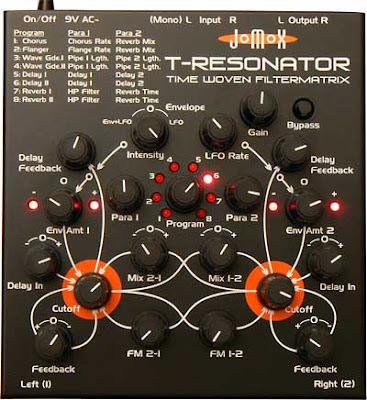 Music Thing: Jomox T-Resonator: Knobs + analog filters + digital delay + feedback = fun? Jomox T-Resonator: Knobs + analog filters + digital delay + feedback = fun? This is the new thing from German boutique gear maker Jürgen Michaelis, the Jomox T-Resonator. As a fan of knobs, feedback, delay and filters, I'm quite intrigued, and I love the bonkers-ness of the diagrams all over the case. Some of the sound samples are great (like this one) although judging from Big City Music's video demo, it's pretty hard to control (this clip is a bit more musical). Anyone tried one yet? They're £200 from Thomann, $399 from Analog Haven. UPDATE: Here's a much better video from Big City Music, via Matrix. mines on order from thomann, i'll let you know when it arrives! The delay side doesn't seem transcendentally complex (can do all of that stuff with an evolverm if you have one). It's the filter matrix that I am most curious about.